If you’re looking for the next crisis, you’ve come to the right place. Candy conversation hearts, the iconic Valentine’s Day candy, won’t be on store shelves this year. 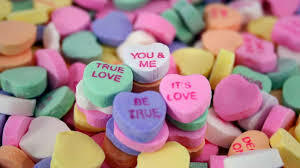 Necco (New England Confectionery Company), the parent company of Sweethearts, ceased operations back in July. Now Americans are faced with the terrifying prospect of having to use their own words to express their love. For any station that wants to save their listeners from this nightmare, the candy is being sold online, but due to anticipated demand, rationing has already begun. Fortunately, plans are already in place to resume making the candy hearts next year. In the meantime, Krispy Kreme is stepping up to help fill the void. With people wearing multiple hats and often finding that there aren’t enough hours in the day, how do we navigate the crisis of the moment and infinite distractions without sacrificing what’s truly important, but often not urgent? For many, multi-tasking is a necessary evil. Sitting through a meeting, means falling behind on email, so you pick up the phone and take a quick look. In fact, according to MIT research, “people who juggle between two and four projects at a time tend to be more productive than those who focus exclusively on one. This way, you can continue making progress in one area when you’ve temporarily run out of steam in another.”To help determine, whether or not multi-tasking is appropriate, Fast Company put together this matrix. Whether the next crisis is real or imagined, the communities we serve turn to radio for context and information, so these skills are essential. This entry was posted on Monday, January 28th, 2019 at 9:14 am and is filed under Nielsen ratings, radio, radio marketing, Uncategorized, Vanity Metrics. You can follow any responses to this entry through the RSS 2.0 feed. You can leave a response, or trackback from your own site.